Jostling through crowds of Germans and tourists in the Rhine River village of Bacharach, I climb to the sun deck of the ferry and grab a chair. With the last passenger barely aboard, the gangplank is dragged in and the river pulls us away. I'm captivated by the Rhine. There's a rhythm to the mighty river that merges with its environment: black slate cut from plains above, terraced vineyards zigzagging up hills, husks of ruined castles, and stoic spires of stone churches slicing vertically through townscapes. Passengers' parkas flap in the cool wind as the rugged hillscape gradually reveals castles both ruined and restored. The ridges of the gorge rise above us, unblemished by any modern building, thanks to a strict code that holds the tide of contemporary Germany back, out of sight from this romantic river escape. Tortured green vineyards climb steep hillsides, and turreted towns grab friendly bits of shoreline. Trains streak like arrows along both shores. Bright green and red buoys battle the current, keeping the cautious parade of barges and sightseeing boats off the many reefs. The sheer bulk of history that has poured through this river valley rouses any romantic soul. It was here that the ancient Romans decided to call it an empire and draw the line that defined their vast holdings — separating barbarians from the civilized world. It was here that Prussian General von Blücher used an innovative pontoon bridge to cross the Rhine and flank Napoleon's forces (on their way back from a disastrous Russian campaign). And it was also along the Rhine where US General Omar Bradley's troops found a bridge still standing at Remagen to bring World War II into Hitler's heartland. While the Rhine is over 800 miles long, the 36-mile stretch from Mainz to Koblenz is by far the most interesting. This is the Romantic Rhine, a powerful stretch of the river slashing a deep and scenic gorge. And the best way to see it is to cruise it. While some travelers do the whole Mainz–Koblenz trip, today I'm just focusing on the most scenic hour — cruising downstream from Bacharach to St. Goar. From early April through October boats run daily in both directions from Mainz to Koblenz. Most travelers sail on the bigger Köln–Düsseldorfer (K-D) Line; the Bingen–Rüdesheimer Line is cheaper but makes fewer trips per day. Both cruises offer the same evocative scenery. 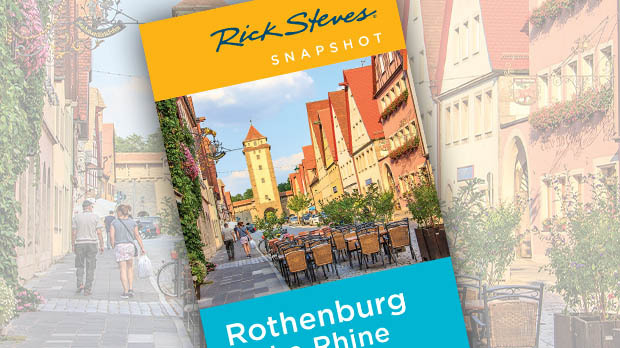 There's a little narration, and studious passengers use handy Rhine map-guides to identify the sights we pass. All along the Rhine, it seems each castle and every rock comes with a story. Many of the castles were "robber-baron" fortresses built by petty princes and two-bit rulers back when there were 350 independent little states in what is today's Germany. The castle owners raised heavy chains across the river when boats came — and lowered them only when the merchants had paid their duty. 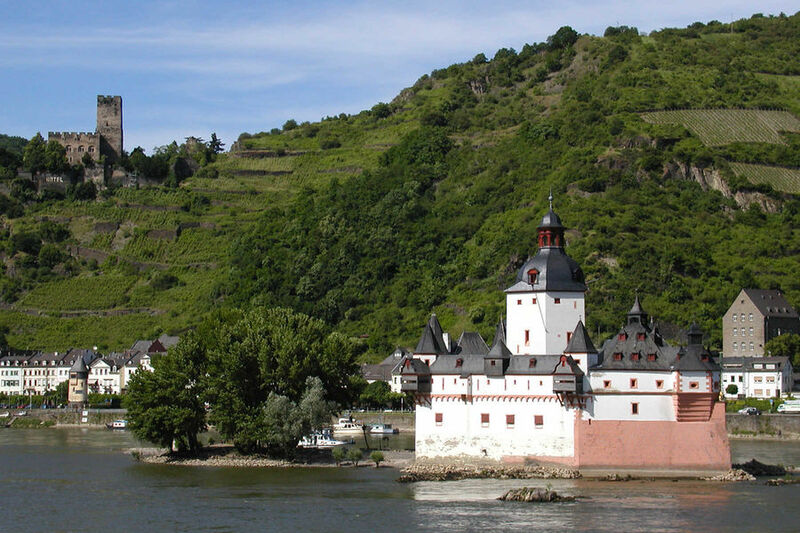 We sail close by one of the many scenic fortresses — Pfalz Castle — that were built on an island in the middle of the river. As the cliffs get steeper, the rocks darker, and the river faster, the scenery becomes more dramatic. With the boat's sun deck filled mostly with beer-sipping, ice-cream-licking Germans, our collective pulse quickens as we approach the mythological climax of this cruise. Over the ship's loudspeakers comes the story of Loreley — the maiden who seduced sailors into shipwrecks. Because of the reefs just upstream, many ships never made it to St. Goar. Sailors (after days on the river) blamed their misfortune on a maiden whose long blonde hair almost covered her body. This legendary siren flirted and sang her distracting song from this rock, a legend immortalized in the poetry of Heinrich Heine. 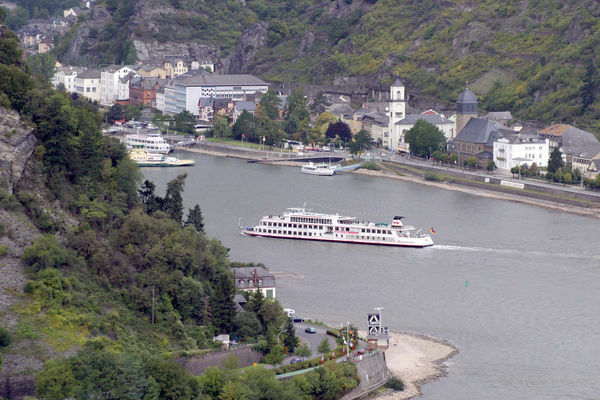 Our boat survives the Loreley and docks in St. Goar, a classic Rhine tourist town. Its hulk of a castle overlooks a half-timbered shopping street and leafy riverside park, busy with sightseeing ships and contented strollers. Sitting like a dead pit bull above St. Goar, Rheinfels Castle rumbles with ghosts from its hard-fought past — the single best Rhineland ruin to explore. While the town of St. Goar itself isn't much more than a few hotels and restaurants, it still makes a good base for hiking or biking the region. A tiny ferry will shuttle you back and forth across the busy Rhine from here. For a fun little jaunt, take a quick round-trip with some time to explore the other side. Through this green valley of medieval castles and their legends, the quiet, deep-gray power of the river flows as steadily as time itself, a dance floor where ferries, barges, and sightseeing boats do their lumbering do-si-do past fabled and treacherous rocks.